Members of the MG Owners’ Club have been invited to participate in this unique event. Hosted in the grounds of the superb Chateau Chantilly, the Arts & Elegance event is like a grand garden party surrounded by some of the best and beautiful cars in the world. As well as a “concourse d’Elegance” competition for modern supercars and a superb “concourse d’Etat” competition for classic cars from around the world, there is a car clubs “Grand Prix” competition with some of the best car clubs in Europe as part of the display. Check at Folkestone for the 10:20hrs Eurotunnel crossing to Calais. 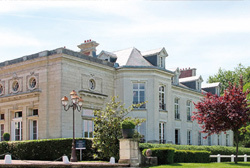 From Calais we drive through the French countryside to our 4 star chateau-style hotel in the town of Maffliers in the Picardy region, North of Paris. A group dinner has been arranged for the Saturday evening. After an early breakfast we drive the short distance to Chantilly & park our MGs in the appropriate area as reserved for the MG Owners’ Club. The remainder of the day will be at your leisure to explore the chateau & view the displays of cars in the formal gardens of the chateau. You will be able to enjoy a picnic lunch in the exceptional grounds and also enjoy vintage boat tours along the grand canal. In the afternoon, everyone convenes at the main square for the final judging of the competitions and the presentation of awards. There will also be equestrian and fashion displays at this time. You are at your leisure in the evening to dine in Chantilly, back at the hotel or venture in to Paris itself. After a leisurely breakfast it is time to return North to Calais. You can choose to return quickly via dual-carriageway or at your own pace through the rural French countryside.